Do you have trouble dealing with your feelings? Whether you feel unworthy of love or you are holding back in your relationships, you need to balance your heart chakra and this bracelet can help you with your healing process. 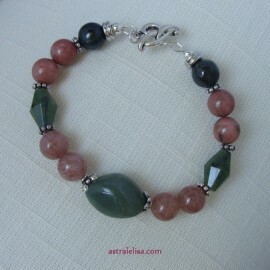 This bracelet combines green aventurine, strawberry quartz, green kyanite, rhodonite and jade with silver-plated components; it fits an 8-inch wrist but it can be adjusted to a slightly smaller or larger size.